I am back with our Day 2 trip report. On Day 2, we took a bus bound for Tokushima (徳島/とくしま), which is one of the prefectures of the Shikoku (四国/しこく) region. Honestly speaking, our Shikoku part wasn’t well planned out, but we managed to have some fun riding an electronic scooter, which i will explain later in Day 4. ↓ was our breakfast for Day 2. St Marc’s croissant, one of the best croissants out here in Japan, i feel. We also hanged out at one of the cafes while waiting for our bus. This was our bus to Tokushima, which costs 2300 yen if you book early enough. Your Japanese level should be about minimum N4 to book the tickets online. The whole journey took about 2.5 hrs. ↓ was the parking area that we stopped halfway.. Here we are. Tokushima. We stayed in Toyoko Inn, which was about 5 mins away from Tokushima station. For Day 2 lunch, we decided to settle for Tokushima Ramen. You can read more about Tokushima Ramen here. After lunch, we decided that we will roam around the city. For Tokushima, one of the best festivals that they have is Awa Odori. But too bad, we missed it by 1 week. 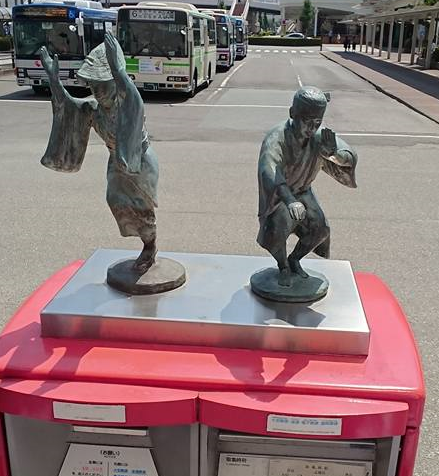 One of the spots: The Awa Odori Post box. After another 2.5 hours journey back to Tokushima, we headed to another izakaya for supper.